Most of our students live in the Ingleby Barwick area or chose us because we are a Church Academy. 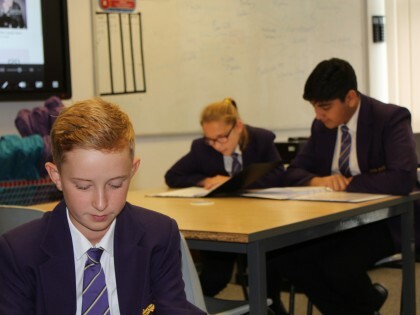 Most parents already know that All Saints has an outstanding reputation in the Teesside area for being an Academy that provides an excellent education in a very special Christian environment. All Saints is an Academy that firmly believes ‘every child matters equally to God’. It is an environment where every child is seen as an individual and where every member of staff is dedicated to ensuring that students are supported to achieve their potential in all that they do. We have an unrivalled reputation for supporting and guiding our students to fulfil their potential. Our staff are a well-qualified team who ensure that our students are prepared for each new step they take. We pride ourselves that our transition process supports our new students to make the move from primary to secondary school easily and successfully. There will be an opportunity, from 5:00pm, to visit uniform suppliers in the sports hall prior to the evening presentations which begin at 6:00pm. We expect to conclude by 7:30 pm. Can't wait? Why not take a look around before you arrive in September? Click on the maps below to take a virtual tour. All information shared during transition will be available to download below.